Please feel free to link to our home page if you think it may be of interest to visitors to your site. If you want to use a picture rather than text link then you can use the image below (Right Click and 'Save Image As'). If you have a relevent link for our links page then please Contact Me with your URL details. The links provided above are for reference only. 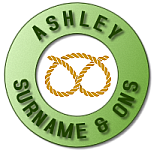 I or ashley-surname.org.uk shall not be held responsible for content provided on those sites. We make no endorsements for the information, products or services provided by the authors of any third party sites linked from this page and nor do they endorse this site in any way. Please seek permission from the relative body to reproduce any of these links or images for your own use. If you are responsible for any of the above images/links and would like them to be removed from this site please contact us.